On Sunday afternoons, in homes around France, chicken in its many guises takes pride of place at the dining table. It’s likely to be grounds for a family uprising if something else other than chicken is served. Pot chicken with flavours of lemon and garlic is a light and bright family meal that has its roots in the Alsace region of France. Many restaurants have their own take on this dish, yet it always includes a sweet organic chicken with the choice vegetables of the season. It’s one of those surprising dishes that is comforting, yet more complex in flavour and sophisticated than you would first expect. This dish screams comfort in a pot and the dough-sealed lid produces a clean and intense broth, not muddied by cream or thickened with flour. The addition of sweet potato provides an intriguing hint of sweetness balanced by the lemon. If you do want to make its more substantial cousin for a heartier winter meal, you can add some sour cream or yoghurt to the recipe before cooking. I begged this recipe from a friend whose childhood culinary memories, growing up in Alsace, are steeped in foods such as this. She explains that the dough seal, although functional, also adds some anticipation and drama when serving the dish. Bring the hot dish to the table before breaking the seal to allow the aromas to excite the taste buds of your guests. To give this meal some further substance but not pack it out with carbohydrates, I partnered it with a cauliflower puree tinged with a hint of nutmeg. You will need a casserole pot with lid, large enough to hold a whole chicken and the vegetables. Preheat the oven to 215C. Using a sharp knife cut the lemon peel strips into small cubes. Discard the pulp or keep to re-use in another dish. Bring the one cup of water and sugar to the boil in a small saucepan, add the lemon peel and cook for one minute. Drain the water away, keeping the lemon peel, and set aside. Heat two tablespoons of olive oil in a large frying pan over high heat. Add the vegetables and garlic, season to taste with salt and pepper. Saute the vegetables until they are slightly golden. Spoon the vegetables into a large casserole pot, big enough to take a whole chicken. Add the herbs and the lemon peel. Return the frying pan to the heat, add another tablespoon of oil and brown the chicken on all sides, seasoning well with salt and pepper. Place the chicken into the casserole pot, tucking it between the vegetables and herbs. Add the stock, wine and any remaining olive oil to the casserole pot. Place the flour and water in a medium bowl and mix to a soft dough, adding water or more flour as needed. Flour a work surface and roll the dough into a long snake, the same length as the rim of the casserole pot. Place the dough around the rim of the pot, pushing down to make it fit, ensuring it goes right around to meet the beginning. Patching any holes. Place the lid down over the dough, pushing firmly to form a seal on the pot. Place the pot into the oven and bake for one hour. Bring a medium sized saucepan of lightly salted water to the boil. Add the cauliflower florets and cook until tender. Remove from the heat and drain well. In a blender or food processor place the cauliflower, cream and nutmeg and blend until pureed. 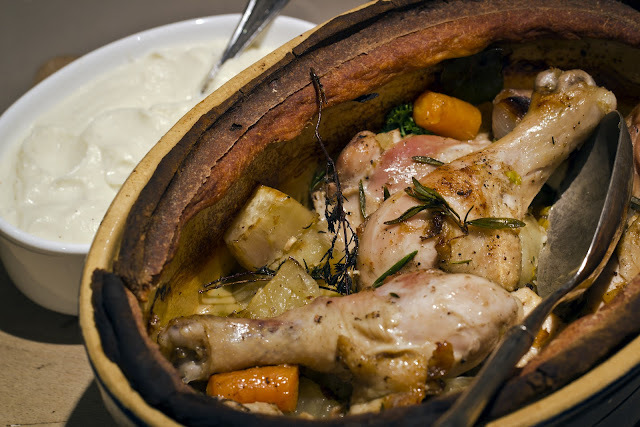 Place into a heatproof bowl ready to reheat for serving as a side to the lemon pot chicken. Move over macarons and cupcakes, it is the Kouign Amann that is taking the US by storm and infiltrating bakery shelves here in Australia. It’s been seen loitering in some of the trendy Sydney and Melbourne bakeries and it seems in the US the demand is outstripping supply. Just quietly, the French are way ahead of us by a few hundred years, but don’t worry all good things come to those who wait. Unless you’re a competent cook, then waiting is something you might have to do, because this little slice of heaven is a tad time consuming, but not impossible to do. What is Kouign Amann you might ask? It’s sometimes been described as a cake or a pastry, but always sublimely addictive. It originates in Brittany, France and the pronunciation is something like ‘kween amon.’ The dead give away, is that in the Breton language it translates to ‘cake butter.’ Getting the idea now? In around 1860, pastry cook Yves Rene-Scordia opened a bakery in the coastal Breton town of Douarnenez and his speciality so impressed the locals that it soon grew into an obsession. If like me, you find a flaky, pure butter croissant or a pillowy and light brioche simply irresistible, expect to find yourself hooked on Kouign Amann. It is partly about the texture, but it’s more the crisp caramelisation of the outside shell of the cake with the flaky buttery layers that creates the desire to further indulge. It takes considerable willpower to stop at one piece. You will need to set yourself an afternoon aside to create these buttery gems, and find a warm spot in the house to allow the dough to rise for a couple of hours before baking. If you don’t have a warm corner to allow them to rise, I placed the two dough-filled cake tins, covered in plastic wrap, under the doona in the spare bed with the electric blanket on low. This worked a treat. In actual fact they kept my rye mother company which was fermenting and bubbling away between the sheets. 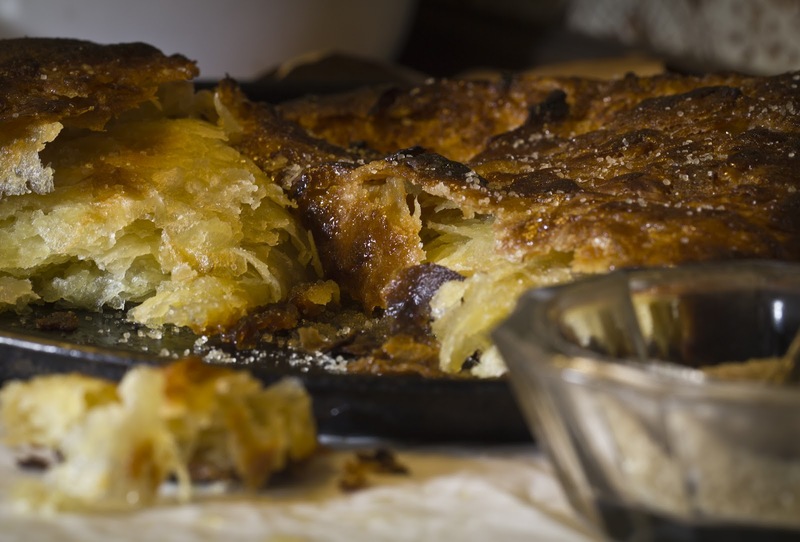 Don’t be put off by the difficulty, Kouign Amann is not only incredibly satisfying to make, it is even more satisfying to eat. In a large bowl, place the flour, water, salt and dried yeast. Mix the dough until it forms a combined mass. Alternatively, you can use an electric mixer with a dough hook. Form the dough into a ball, cover with plastic film and refrigerate for about one hour. On a floured bench, roll the dough out flattened to a square about one centimetre thick and dust with flour. Place the butter between two sheets of baking paper and using a rolling pin, bash the butter to flatten to about one centimetre thickness and place it centrally on top of the rolled out square of dough, so it doesn’t quite reach the sides of the pastry. Fold the four edges of the dough into the middle to completely envelop the butter. Roll the top of the dough slightly to seal the folded edges to stop the butter from escaping. Roll the pastry out to a rectangular strip about one centimetre thickness. Take the shorter and lower end of the strip and fold it up one-third of the way toward the top. Now fold the top down to fit over the first fold to form a neat rectangle with no overlapping sides. Place the folded dough onto a baking tray and cover with baking paper, and again refrigerate the dough for 30 minutes. Remove from the refrigerator and with the outside fold facing to your right, roll it out again to a long rectangle about one centimetre thickness. Sprinkle with a generous amount of sugar, then fold it again as before, coating all sides with sugar. Place in the refrigerator to rest for 30 minutes. Repeat the previous step of rolling, coating with sugar and folding one more time, then rest the dough in the refrigerator for 30 minutes. For each roll, place the outside folded seam to your right before rolling. This technique will give you the flaky and buttery layers. When refrigerated, roll the pastry out to a rectangle of one centimetre thickness. Cut it in half, then fold the four corners of the dough to meet in the centre, so you have a smaller square. Roll lightly over the folds to seal and sprinkle with a little more sugar. You should have used most of the 300 grams of sugar. Place the two pieces of dough in two buttered cake tins, pressing slightly so the dough fits the tins well. Cover the cake tins with a tea towel and leave to rise for two hours in a warm place. Or place in your heated bed with the electric blanket on low. First published Canberra Times, 1 August 2012. By this stage of the year, I’m a bit over all those stolid dishes made from seasonal winter veggies. To top it off, tonight I don’t much feel like cooking a big dinner. I just want a quiet evening at home sipping a big glass of red wine and scoffing yummy mushroom pies with rich, buttery puff pastry. If puff pastry scares you, don’t worry. I’m using a pain-free, store-bought organic version. While it did cross my mind to make my favourite Maggie Beer sour cream pastry, my tried and true food philosophy is, if I’m not in the mood to make it, I won’t force it. When I ignore this rule, it more often than not ends in disaster. Good. Permission to instantly reject the Maggie Beer. Out of the frozen depths of the packed freezer, I remove the sealed puff pastry packet, ingredients listed as NASAA certified organic unbleached wheat flour, pure butter, sea salt and Otway ranges water. This can’t go wrong. A standby in French homes, savoury tarts are often cut into small portions, or made as tartlets and served with an aperitif. The tarts are made by cooking vegetables, such as leeks or onions, asparagus or mushrooms, and then combined with cheese or cream to make a smooth filling. The filling can be spread onto flatbread dough or sheets of puff pastry. They are frozen for use when required and little justification is needed to invite the neighbours, friends or family in for an aperitif and snack. These pies are great to serve as a starter, but if feeding people for a main, I like to convert it to the grander version, individual mushroom pies. If you prefer to make the small tartlets, use the mushroom filling mixture, just reduce the size of your pastry tart moulds or rounds. If making a large tart, spread the mushroom filling mixture over a sheet of puff pastry. This particular recipe is delicious and has many different layers of flavour. The twist in the tail here is the addition of a port reduction, bathing the mushroom mixture in a silky stickiness, which curiously enhances the earthiness of the mushrooms. 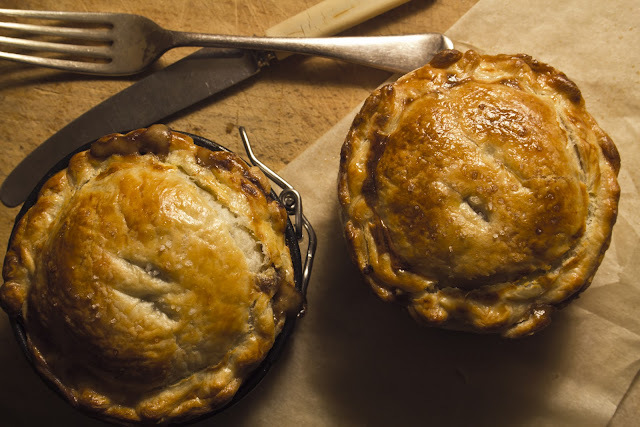 To further develop the flavours, and if you can hold off long enough, the mushroom mixture can be left to sit in the fridge overnight before filling your pie or tart moulds. These pies or tartlets make a great fast food, taken straight from the freezer for unexpected events. Lightly grease four, 10 centimetre pie tins, preferably ones with a removable base. On a lightly floured surface roll out the pastry sheets, slightly thinner than their existing thickness. Using one of the pie tins as a guide, cut around the base adding about two centimetres to the diameter of the circle, so you have a pastry base that covers the base of the pie tin, and comes up over the sides with a small overhang at the top. Push the pastry firmly into the base of the pie tin. Repeat this process for each pie. You will have some pastry left over for the pie tops. Refrigerate the left over pastry and the pastry filled tins. In a small bowl, combine the dried mushrooms and the hot stock. Cover and let them soak for at least half an hour. Drain the mushrooms through a sieve, pushing down to squeeze out the stock. Reserve the stock. Coarsely chop the mushrooms and set aside. In a large frying pan over medium heat, melt two tablespoons of the butter. Add the shallots and garlic and saute until softened, about two minutes. Add the mixed white and brown mushrooms. Increase the heat to high and continue to saute until browned, about four minutes. Add a little butter if they begin to stick to the pan. Add the rehydrated mushrooms, and saute until combined, about two minutes. Transfer to a bowl and set aside. In the same pan over medium heat, melt one tablespoon of the butter. Sprinkle in the flour and cook, stirring to blend until lightly browned. Stir in the reserved stock from the dried mushrooms. Cook, stirring until the mixture thickens, one to two minutes. Add the cream, stirring to blend. Stir in the mushrooms and season with the cayenne, nutmeg and salt to taste. Continue to cook, stirring until the mixture is bound together and almost no liquid is left, about two to three minutes. Transfer to a bowl and set aside. Rinse the frying pan and return it to a medium heat. Add the remaining one tablespoon of butter and the ham, and cook, stirring for one minute. Add the Port, increase the heat a little and bring to the boil. Cook until the liquid reduces, almost to a glaze, this should take about three minutes. Remove from the heat and add the hazelnuts, stirring to combine. Pour over the mushroom mixture, stir to combine, cover and refrigerate till cool. If you wish, the mixture can be left overnight at this stage to allow the flavours to develop. Remove both the cooled the mushroom mixture and the filled pie tins from the refrigerator. Spoon the mushroom mixture into the pie tins, dividing it evenly and heaping it slightly in the middle. Roll out the remaining pastry into a square and cut four rounds of 11 centimetres each. Carefully lay each round over the filled pies. Fold the overhanging pastry from the base and sides up and over the pastry lid, crimping the pastry with your fingers to seal. Cut a couple of slits in the pastry lid. Using a pastry brush glaze the top of each pie with the egg and milk mixture. Bake the pies until the tops are golden for about 20 to 30 minutes. Transfer to a wire rack and let cool for a few minutes before removing the sides and bottoms. Delicious served with green vegetables and a bottle of Pinot. The quantity makes four pies.